It is one of the largest primates in the world. It has two subspecies: the Eastern lowland gorilla (Gorilla beringei graueri) and the Mountain Gorilla (Gorilla beringei beringei). Eastern gorillas have a robust body, covered with a layer of black fur. Their arms are long, their nose flattened and their torso, less hairy in the chest area, is broad. Their face, soles, and hands are hairless too. Adult males have a silvery-gray patch on the back, receiving for this the name of “silverback”. The fur of the mountain gorilla subspecies is slightly bluish and shorter than the eastern lowland gorilla. Males’ height is 1.7 meters on average but can reach up to 1.8 or 1.9 meters. There is sexual dimorphism, as males are larger than females. The male weight ranges between 140-205.5 kg, while the females are around 90-100 kilograms. Females are about 1.5 meters tall, but males reach up to 1.8 or 1.9 meters. Both subspecies live in different areas, despite being in the same eastern Africa region. Their range covers an area through Uganda, Rwanda and the west of the Democratic Republic of Congo. The eastern lowland gorilla lives in the east of the Democratic Republic of Congo. Mountain gorillas are fewer and divided into two subpopulations: one inhabits an area of about 440 square kilometers in the volcanic Virunga Mountains, along the border between Rwanda, Uganda and the Democratic Republic of Congo, and the second dwells the Bwindi Impenetrable National Park in southwestern Uganda. Gorillas inhabit biomes that have some differences from each other, given the different locations where they live. In the Bwindi forests, they inhabit steep hills at an altitude of 1.100 to 2.400 meters above the sea level. The gorillas inhabiting the Virunga Mountains, always live in places that exceed 1,500 meters but can reach up to 4,000 meters, and they fancy bamboo forests, subalpine areas, and cloud forests of those areas. Eastern lowland gorillas inhabit the places located between the Lualaba River and the Edward and Tanganyika lakes. This species is mainly a herbivore as their diet is predominantly vegetation. Their distribution range is smaller than other subspecies, and the availability of fruit in that reduced area is not frequent. However, the eastern gorilla diet is also related to the altitude of the forest where they live. Those dwelling the Bwindi area, eat more fruits than those from other locations. Occasionally they eat bark, flowers, roots and even small invertebrates. The eastern gorilla has a social structure based on groups, not attached to a territory, led by a “silverback” male, several females and their offspring. There are several family groups interconnected, whose members reach between 35 to 50 individuals. They spend almost 40% of the day relaxing and 30% in feeding-related tasks. Eastern Gorillas are diurnal. They spend nearly 40 percent of the day resting and 30 percent in feeding-related tasks. The rest of the time they are usually traveling. They sleep on nests built on trees or steep sites on the floor. Individuals are mostly peaceful, although dominant males can be aggressive with intruders. 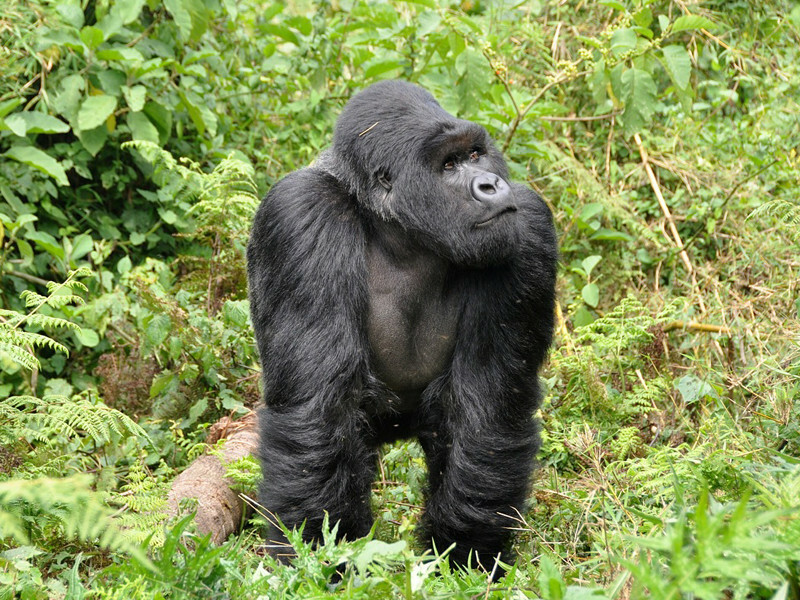 Violent fights between “silverbacks” for controlling an area or a female sometimes happen. Eastern gorillas are polygamous, but only the leader has access to the females of a group for breeding. There is no specific breeding season, and sexual maturity comes first in females than in males. On average, a female reaches maturity at ten years old and can give birth every 3 or 4 years, which mean that they can deliver only 2 to 6 offspring over a life of 40 years. The gestation period of eastern gorillas is about 8.5 months. Usually, only one infant is born, and the mother carries him on her back, for some time. The young also sleep on their moms’ nests and begin to walk when they are between three and six months old. At 3-3.5 years of age, the mothers stop providing them with breast milk. The species Gorilla beringei, is listed by the IUCN red list as endangered and its population continues to decline. The mountain gorilla subspecies (Gorilla beringei beringei), is critically endangered in a riskier condition to survive, due to the small number of individuals that exist today. According to the Red List of the International Union for Conservation of Nature (IUCN), they are only about 300 mature mountain gorilla individuals. There are approximately 300 mature mountain gorillas left in the wild. Their main threats are poaching, habitat reduction as a result of agriculture and farming and the armed conflicts in the regions where they live. Many gorillas have been victims of gunshots not aimed at them. Their trade is prohibited internationally, and many live in protected areas or national parks that ban their hunting. However, it is required a stronger awareness of their importance in the world and the imperative need to keep them alive.